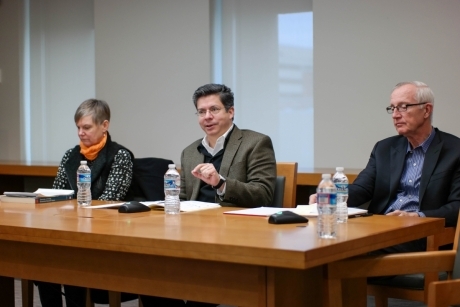 Photograph by Lawrence Gadsden Jr.
On December 8, 2014, the DC D-CFAR and the GW Libraries co-hosted the Writing & Publishing Panel on HIV/AIDS at the Gelman Library, as part of the ongoing series Strategies for Interdisciplinary Publishing Success (SIPS). The panel featured Dr. Jose Merino, US Clinical Research Editor for the BMJ, as well as researchers from GW's Milken Institute School of Public Health and the District of Columbia Developmental Center for AIDS Research (DC D-CFAR). Experts on publishing in HIV/AIDS related literature discussed strategies for publication and provided support to those new to the process or with multiple demands on their time. Video from this panel is featured above.